I’m absolutely thrilled with how it turned out. I haven’t had to damage the original slide viewer at all to mount this either. 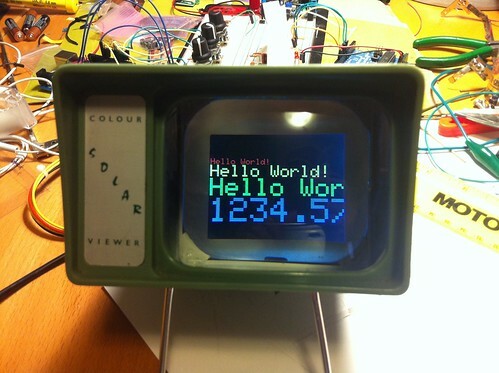 I’m using Adafruit’s 1.8″ TFT LCD for this, which talks to the Arduino over SPI. I’m trying to get everything in Yoda 2.0 communicating over I2C, so I’m writing some adapter code to be able to call the TFT library over I2C instead. 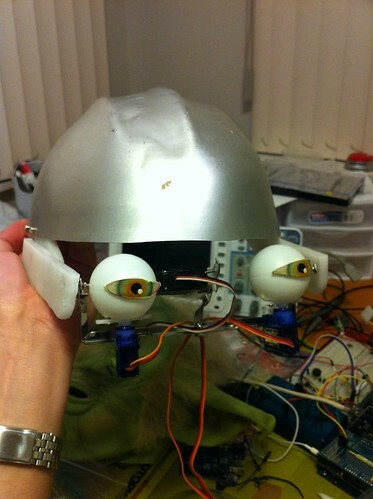 I made some good progress last night re-engineering the eyes. 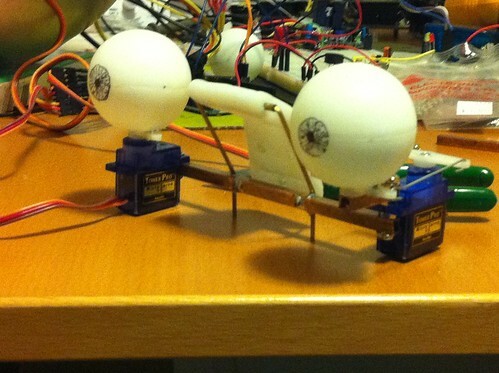 As you may remember from the previous post, the servos were getting in the way, so I needed to move them. Well, success! The one on the left is the original, with the servo directly under the eye. 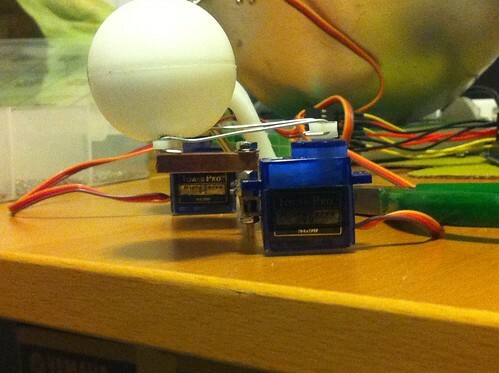 The one on the right is the new one, with the servo moved back, and a linkage to rotate the eye. 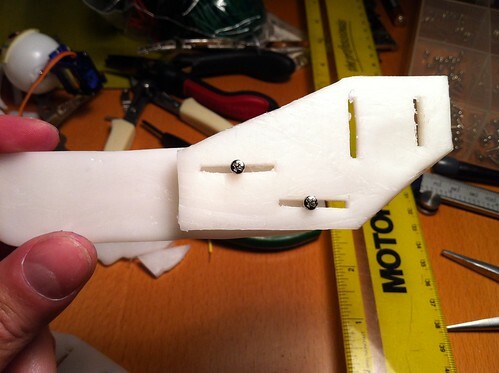 The above picture should demonstrate how much extra clearance below the eye I was able to get by moving the servo. I’m very happy with how that worked. The rod that was actuating the eyes up and down (as can be seen running vertically two photos above) snapped, due to fatigue. So I ended up having to redesign that part too. I got it done last night, but didn’t take any photos of it when I was finished, so I’ll post that once I take photos. So far, great success with the eyes. 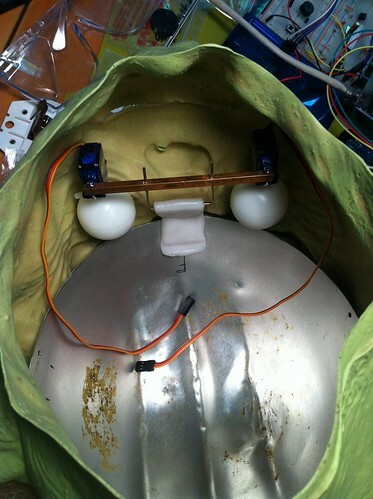 Over the past couple weekends, I’ve managed to spend some time working on my animatronic Yoda head. Unfortunately, Yoda wasn’t build to stand the tests of time. We moved offices, and he was damaged during the move, enough that he didn’t function any more. Considering he was built in only 16 hours, I think he did well. Fast forward to now. There were tons of things I would have liked Yoda to be able to do, but that we obviously couldn’t get done in only 16 hours. So I’ve decided to build a new and improved Yoda, which I’m calling Yoda 2.0. My goal is to have him done (well, at least somewhat done, there will always be more to add) in time for Vancouver Mini Maker Faire 2012. I decided that one of the first things to tackle was the thing I expected to be the hardest: the eyes. I want Yoda 2.0 to be able to look left and right, up and down, as well as near and far, which means independent horizontal control for the two eyes. The metal is all from the frame of an old laptop screen, which has since been turned into a digital photo frame. It’s quite strong. I broke a few drill bits trying to drill only a couple holes in it. 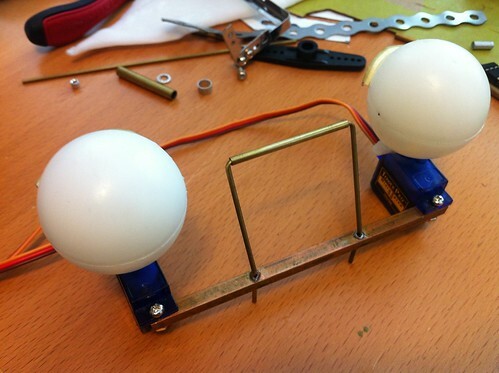 The idea was that the horizontal frame would rotate along the horizontal axis of the two ping pong balls used as eyes. To achieve this, on the left and right edges there is an upside-down L bracket coming from the rear horizontal bar, that comes up right beside the eyes. This bracket has holes in it in like with the horizontal axis of the eyes. 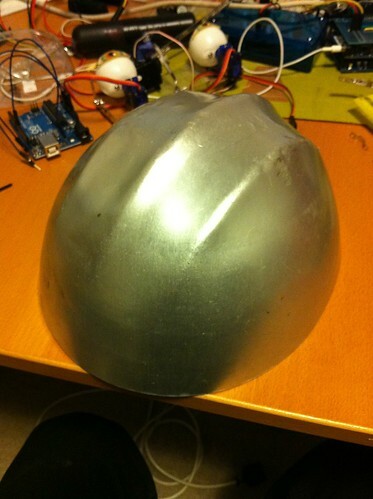 My plan was to mount this to the head on pins of some sort, to allow it to rotate. 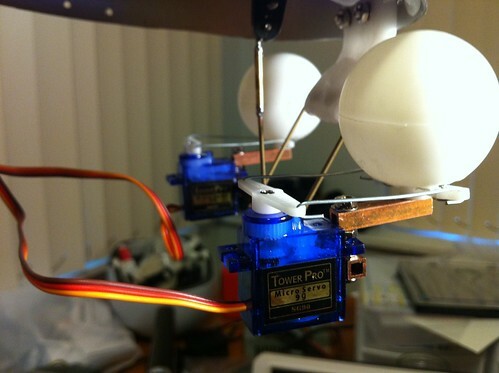 The servo in the middle is also in-line with the axis, so by mounting that rigidly in the head, it should allow the eyes to look up and down. Excellent! 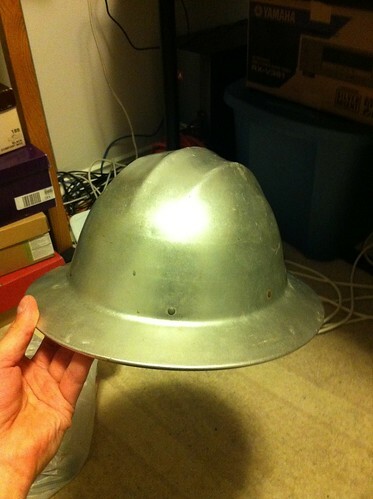 It fits perfectly inside the Yoda mask, and should serve as a perfect frame to attach everything to. The center servo isn’t yet attached, so I can rotate the eyes by hand to see how it works. And it worked great. Until I put the mask on it. The PCL mounts on the left and right stick out way too far sideways, and to far forward from the eyes, which either leaves them stretching the mask so badly that the PCL mounts are visible through the eye holes, or leaves the eyes sat back so far you can hardly see them. Well, back to the drawing board. I decided to call it a night. It actually seems to fit pretty much perfectly, so I went ahead and drilled some holes to bolt it in solidly. Well, there’s a couple problems. 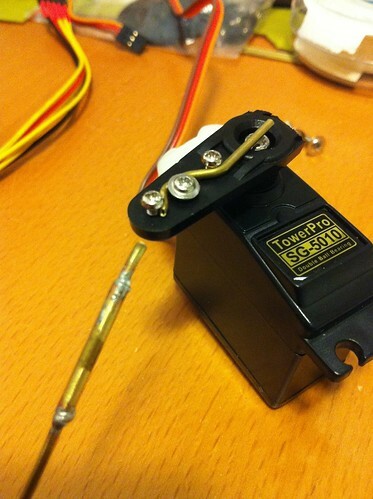 One is that the vertical movement servo has too much flex in the way it’s mounted. When the movement of the eyes is obstructed or resisted at all by the mask, the servo flexes instead of moving the eyes. I think if I add 2nd mount to the back of the servo, this should largely prevent the flexing. 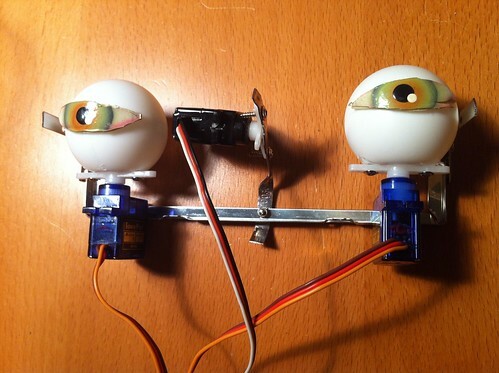 The bigger problem is that in order to look up, the servos below the eyes end up protruding forwards quite a bit. This means they end up hitting the mask, right in Yoda’s cheeks. I think the best way to fix this is to remove the servos from under the eyes, and put a small gear there instead, that rotates around a bolt that’s attached to a bar coming forward from the main horizontal copper bar. 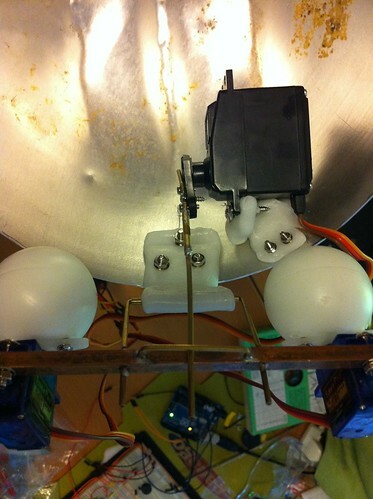 Then mounting the servo behind the eye, with a gear. As an alternative to the gears, since the eye only needs a range of motion of about 150 degrees, I may be able to fashion some sort of linkage. I’ll need to think about that a bit, and play around with some bits of wire before I commit to using some of my precious brass tubes.